If I'm Major League Baseball, I'm mandating that any new stadiums being built - both the Rays and A's are trying to get new ballparks - have a retractable roof. The amount of weather postponements already has been staggering. A whopping six were postponed on Sunday, the most since Sept. 12, 2008, when Hurricane Ike was battering the Gulf Coast. The biggest home game of the Red Sox's season is always Monday's Patriots' Day matchup with an 11 a.m. ET start time, but that was called off Sunday afternoon because the weather is so bad in that area. It's the first time a Patriots' Day game wasn't played since 1984. The Marlins stink, but one bright spot thus far has been young left-hander Jarlin Garcia (0-0, 1.13). His first two appearances were in relief, but Garcia started Wednesday vs. the Mets and no-hit them out over six innings in a no-decision. Because he wasn't all that stretched out, the team had to pull him after a career-high 77 pitches even in a no-no. Only a couple of Yankees have faced him. New York's Masahiro Tanaka (2-1, 5.19) wasn't sharp last time out vs. Boston in allowing six runs and seven hits, including a grand slam, against Boston but did get the win. He has allowed four homers in three starts, not a good sign after a career-worst rate of 1.8 HR/9 last season. Former Yankees teammate Starlin Castro is 0-for-6 against Tanaka. Of course, Castro was part of the package that came back for Giancarlo Stanton. Miami adds the DH for this one. Key trends: The Marlins are 1-6 in their past seven Tuesday games. The Yanks are 7-1 in their past eight at home vs. a lefty. The "over/under" has gone under in six of Tanaka's past seven starts. Early lean: Marlins on runline and under. A reminder that Rockies superstar Nolan Arenado will be out a bit as he serves a five-game suspension. He was penalized for his role in a brawl with the Padres last week and decided to start serving it Saturday. Nice break for Pittsburgh and Tuesday's starter Trevor Williams (3-0, 1.56). He limited the Cubs to a run and four hits over six innings on Thursday. Arenado hit him better than any other Rockie, going 2-for-3 with a homer. Colorado's Chad Bettis (2-0, 2.04) has been the team's best starter thus far. He was excellent in Washington last time out, allowing one run and three hits over seven innings. Starling Marte is 5-for-7 off him with two RBIs. Josh Harrison is 4-for-8 with two doubles. Key trends: The Bucs are 6-14 in their past 20 vs. the NL West. The under is 8-3 in Williams' past 11 at home. It's 7-3 in Bettis' past 10 on the road. Fox Sports 1 game from Hiram Bithorn Stadium in San Juan, Puerto Rico. At least we know that won't be snowed out like the Twins' home games Friday-Sunday were against the White Sox. Minnesota has played just 11 games so far because of so many postponements. It's Tribe ace and reigning Cy Young winner Corey Kluber (1-1, 1.57) on the bump. The righty is 8-5 with a 3.31 ERA in 19 career starts against Minnesota. He dominated the Tigers last time out, allowing just two hits and striking out 13 in a victory. Kluber was to start Sunday, but the Indians' game was postponed. He is 8-5 with a 3.31 ERA in 19 career starts against Minnesota. Brian Dozier is just 6-for-43 with 13 strikeouts off him. The Twins' Jake Odorizzi (1-0, 2.20) allowed a run over six innings in his last start vs. Houston. Cleveland's Edwin Encarnacion is 5-for-30 off him with two homers. Key trends: The Indians are 15-3 in Kluber's past 18 series openers. The Tribe are 18-8 in the past 26 meetings. The under is 4-0 in Kluber's past four vs. the AL Central. Baltimore has placed second baseman Jonathan Schoop on the 10-day disabled list with an oblique strain. He was great last year with a .293 average, 32 homers and 105 RBIs but was hitting just .230 with one homer in 2018. Tim Beckham figures to play every day at second while Schoop is out. That opens third base, which should be manned by Danny Valencia. The Birds start Andrew Cashner (1-1, 2.50) on the mound. He had been scheduled for Monday in Boston. I'm sure he'd much rather face the Tigers. Cashner shut out the Jays over seven innings last time out but took a no-decision. Only a few Tigers have seen him. Miguel Cabrera is 0-for-4. Detroit left Francisco Liriano (1-1, 2.13) was supposed to start vs. the Yankees over the weekend but, yep, that was postponed. Baltimore's Adam Jones is 8-for-24 against him with three homers. Key trends: The Tigers are 3-8 in their past 11 following an off day. The Birds are 3-11 in their past 14 series openers. The over is 5-1 in Baltimore's past six on the road. MLB Network game in some markets. I believe this will be perhaps the most-watched game on that network this season so far and probably one of the most wagered of the season. Not just because it's a terrific matchup between division leaders, but Shohei Ohtani returns to the mound. He was scheduled to pitch Sunday in Kansas City, but that was postponed. I actually think the Angels were just fine with that as some were questioning their decision to let him potentially pitch in such frigid conditions. 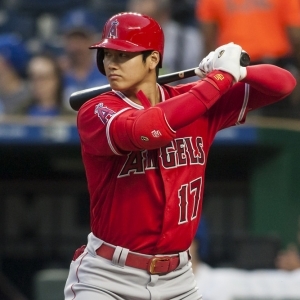 Ohtani has been so good at the plate that I'm wondering how long it takes for the Angels to simply ditch the DH on days he pitches. Yeah, probably won't happen because they don't want to put extra stress on Ohtani (2-0, 2.08). Last time out, Ohtani took a perfect game into the seventh inning vs. Oakland and allowed one hit with 12 Ks over seven innings. He has only faced the A's thus far. Boston, which badly wanted Ohtani, goes with lefty David Price (1-1, 2.40). He left his last start vs. the Yankees after one innings with some numbness in his hand but is fine. Mike Trout can't hit him, going 3-for-21 with 10 strikeouts. Key trends: The Sox are 3-8 in their past 11 at the Angels. They are 4-1 in Price's past five vs. teams with a winning record. The over is 5-1 in Price's past six on the road.